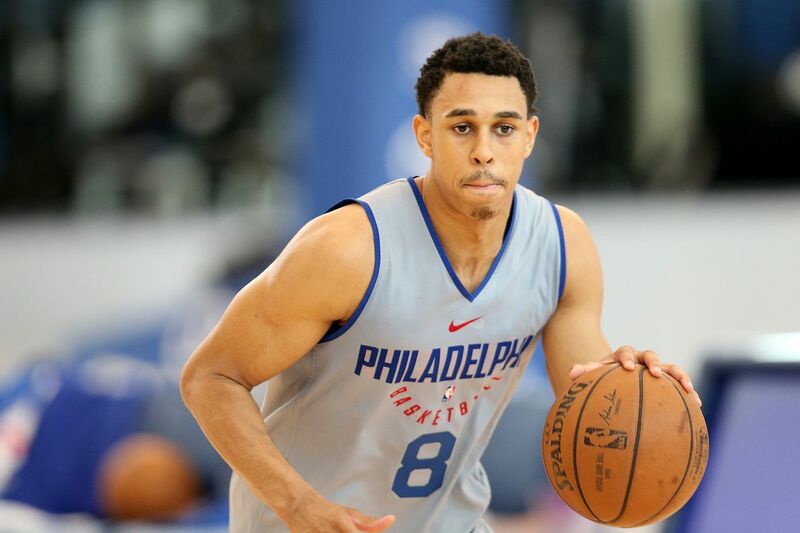 Zhaire Smith is still finding his way as a perimeter player after playing in the post in high school and college. LAS VEGAS – Nineteen months ago, Zhaire Smith was an undersized high school center with no major college scholarship offers. There was also a two-year stretch, from fifth to seventh grade, when most folks didn't take him seriously on the basketball court. Even Smith viewed basketball as just something fun to do. So he knows what it takes to defy odds. "Just keeping working and it's going to show," said Smith, the headliner of the 76ers' 2018 draft class. "I don't know one person that works and they're not really good or successful. If you put in hours, it's going to show." Hard work is what eventually made folks in his hometown of Garland, Texas, start to take the former football player serious on the court. Hard work led to Smith receiving his first major college scholarship offer from Texas Tech in January 2017. And hard work is why the Sixers acquired him in a draft-day trade from the Phoenix Suns. Now, he's working hard to make the transition from being a power forward who was listed as a wing at Texas Tech to a shooting guard with the Sixers. Considered a project, the Sixers don't expect much this season from the player standing 6-foot-2 ¾ without sneakers and never played guard before. Not surprisingly, Smith, who turned 19 on June 4, looked like someone trying to possibly learn on the fly here at the NBA Summer League. At times, he's looked out of place. But there were three or four times a game when Smith displayed the explosiveness and overall athleticism that wowed Sixers coach and interim general manager Brett Brown in the pre-draft process. On Saturday, Smith finished with eight points, five rebounds, two assists, and one steal in Saturday night's 91-89 second-round victory over the Milwaukee Bucks at the Thomas & Mack Center. The Sixers (2-3) will face the Memphis Grizzlies in Sunday's 10 p.m. quarterfinal at Thomas & Mack. Furkan Korkmaz's three-point play with 3.6 seconds left gave the Sixers a 90-89 lead. The Bucks lost the ball on the ensuing possession. Jonah Bolden stole it on Jordan Barnett's pass attempt to Christian Wood in the paint and was fouled. He missed his first foul shot before converting the second with 1.2 ticks left. Milwaukee was unable to get a shot off in the closing seconds. Korkmaz had a team-high 19 points for the Sixers. Wood, a former Sixer reserve center, finished with game highs of 27 points and 12 rebounds. The Bucks finished the summer league with a 2-3 record. Determined to put in the work needed to make the transition a success, Smith will head back to the Philadelphia area once the Sixers are eliminated. He'll work out at the team's practice facility in Camden until the start of training camp in September. While at Texas Tech, players had an option to go home for a few days during Christmas break. However, Smith opted to remain on campus in order to put in work for the Dec. 29 Big 12 opener against Baylor. "I didn't feel like going home," he said," because at home, there really isn't anything to do. … Now, it's important for me to get ready for training camp." Being in the gym will be like old times for Smith. It's also the place where he's been able to turn his dreams into reality. He only looked to have fun during his first two seasons of organized basketball. But the more Smith played, the more he fell in the love with the game. "After I start loving it, I kept working out," he said of the transition in the eighth grade. "I got in the gym my own time." At Lakeview Centennial High School, Smith was the District 10-6A MVP as a senior. He averaged 20.1 points, 6.6 rebounds and 3.0 assists that season and was voted the best dunker in the Dallas area. However, he was only a three-star college recruit, who didn't have any major college offers at the start of that senior season. "I thought I was probably going to have to go a smaller school and kill there and work my way up," said Smith, who had offers from Lamar University, Arkansas at Little Rock and New Orleans. But after receiving his initial major-college offer from Texas Tech in January, Texas, Arkansas, Oregon, Memphis, Kansas State and Georgia Tech also offered. He ultimately chose the Red Raiders over Texas and Kansas State late in his senior year. "They [Red Raiders] are kind of like me. They were under the radar," said Smith, who fell in love with Lubbock-based campus. Now, as an under-the-radar rookie, he's determined to put in the work needed to make a solid impact.